Award-winning photographer George Kalinsky is one of the most famous image makers of our time… or any time. His lens has captured some of the most important faces, places, and events in the world of sports, entertainment, and politics. As the official photographer of Madison Square Garden and Radio City Music Hall, he has created many iconic images. Newsmakers such as Frank Sinatra, Muhammad Ali, Peggy Fleming, Pope John Paul II, Luciano Pavarotti, Patrick Ewing, Bill Russell, and Mariano Rivera have all stated that George Kalinsky has taken their favorite photograph. George has also captured the world’s greatest rock stars on the world’s greatest stage. His iconic shots of Elvis Presley, Aretha Franklin, James Brown, John Lennon, The Rolling Stones, Janis Joplin, Jimi Hendrix, Elton John, and Billy Joel are all displayed in the Rock & Roll Hall of Fame and Museum. On December 12, 2016, the New York Historical Society unveiled “I Am King of the World: Photographs of Muhammad Ali by George Kalinsky.” This critically acclaimed exhibit visually portrays the close relationship that developed between the Champ and the Photographer throughout the nearly 50 years they knew each other. The prints used in the exhibit are now a part of the New York Historical Society’s permanent collection. Among the many other venues in which George’s work has been exhibited are the Museum of Modern Art, the Metropolitan Museum of Art, the International Center of Photography, and The Olympus Plaza Gallery in Tokyo. His works are also part of the permanent collections of the National Baseball Hall of Fame, the Naismith Memorial Basketball Hall of Fame, the Rock & Roll Hall of Fame, Cornell University, the New York Governor’s Mansion, the Jewish Museum of New York, the Southern Vermont Arts Center, the National Museum of Dance and Hall of Fame, and Madison Square Garden. Kalinsky’s honors and awards include the 2001 PMDA International Photographer of the Year (highest award in the photo industry), the National Center for Disabilities Sportsman of the Year (2001), the New York Board of Rabbis Man of the Year (2006), the National Jewish Sports Hall of Fame inductee (2007), the Pratt Institute Lifetime Achievement Award (2008), the National Arts Club Medal of Honor (2010), the New York City Basketball Hall of Fame inductee (2010), the New York Knickerbockers Legacy Award (2015), and Madison Square Garden Walk of Fame inductee (2015). 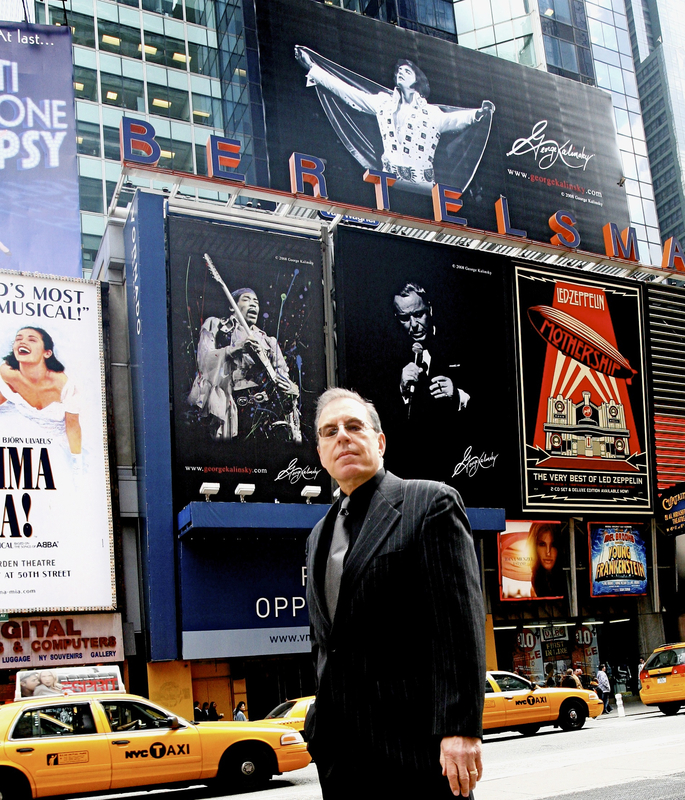 Since 2008, some of George’s most iconic photographs have been displayed on huge billboards in New York City’s Times Square, drawing the attention of millions of passers-by every day. In addition to his ten published books, which have sold more than 2 million copies, Kalinsky’s photos have also appeared in hundreds of other books, magazines, newspapers and web sites throughout the world.